Ok so I last left you with the Killings Field thing..... right well Vic, Abi and I headed off the next morning after yet a nother hamgling session with some random tuk tuk men and we eventually settled on a price. When we arrived it was strange as it is bascially a field - i'm not sure what else i expected but anyway. We paid our admission and then proceeded to have a walk around. Situated right in the middle of the field isa massive stuper (is that the right word) not sure but its a very tall building with all glass sides in it where thousans of skulls (would you beleive) from victums that had been found within the grounds - these had not been buried. It was a very eerie feeling walking around the grouds at certain intervals there were board with information on them we all read them and then it was time to go, i didn't feel right taking photos - i suppose its respect thing more than anything. I'm glad i went though, considering this all happened within the last 30yrs its very sacry to think off the scary stuff that happened and still happens!! I understand that the trial for those invovled within the S-21 prison is coming up very soon - unbelivable!! The folowing day we headed north to a place called Kratie, we came here to see the Irrawaddy Dolphins - Cambodias most endangered while life, these dolphins have no noses and we managed to quite a few of them. With some of them coming right up beside the boat! It was definaately worth the 8hour bus jounely just to see the them. Many of the other people stayging in the hostel were doing the same thing. WE were both glad to get outta tha twee place i think cos we we're gettign eaten alive by either generally bugs or what we think were bed bugs!!! arrrgggghhhh all our stuff was washed at the next stop - which is where we are now. It was a long day of travelling but 6hours in a bus then 4 in a taxi was totaly worth it, this place Sihanoukville - is absolutely beautiful!! ITs cambodais only beech town resort and I can't imioagine that there are many other places that you couold stay right on the beech (on top of infact, waves at doorstep) and pay 15 dollars a night for a room and private bathroom. A little out of our budget but for two nights we stayed there till moving a a more inbudget place. We have decided to stay here for a week and then move base. 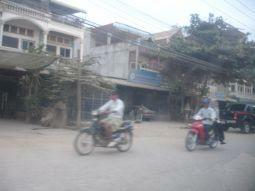 We came here a the last minute as our plans to go cross into vietnam had to be delayed due to the Chineese New yr. It takes place over the 7th 8th and 9th of Feb and seemingly everywehre is full and if your not celebrating it you shoudl avooid it - so were doing the latter. Hopefully transport and places to stay will be more available after the celebrations - we live in hope anyway!! The few computers we have tried to upload photos from are all a bit slow, so I shall put some more photos up when i get the chance.